This is the time of year to gather wild fruits. Mushrooms grow in woods, seaweed and mussels along the shore, hazelnuts, brambles and elderberries in hedgerows, blaeberries on moorland... Given the riches out there, the question begged is - why does nobody gather them? The answer is because our lives are dominated by pre-packaged things from supermarkets. We will interact with nature in a certain way - wetsuited, with a GPS and a blow-up sleeping mattress - but the ultimate act is to put something wild into your mouth. No pasteurisation. No Best Before date. No statutory rights. No guarantee. It terrifies our modern soul - yet satisfies something older. But the one thing we will eat is brambles. Brambles grow in profusion along roads and country paths. Unlike mushrooms, they cannot be confused for anything else. Everyone knows what a bramble is. If you are scared to drink water from a stream and terrified of picking a mushroom, you know where you are with a bramble. At the weekend, we gathered enough for a crumble and some jam - our hands a mess of thorn scars and nettle stings, red bramble juice dark as dried blood. Earlier I quoted Angus Dunn, a Rossshire man whose writing has ripened into High Country, a poetry anthology published by Sandstone Press. Yet this moment of fecundity is also the moment of his premature death. You've probably never heard of Angus - why should you? Poetry can take a bit of effort. A bit like foraging in the woods. Well, I will leave you with some more Angus I have picked for you just for this occasion. It is up to you if you want to add more to your basket. ready for where she's going. I was visiting my neighbours as a teenager, and the subject came round to my parents' forthcoming package holiday to the Costas. "That will be nice," said the neighbours, "you'll enjoy that." "I'm not going," I said. "I don't like those sort of holidays. I'd rather go to the Faroe Islands." "The whit?" said the neighbours, clearly of the opinion I wasn't quite all there. 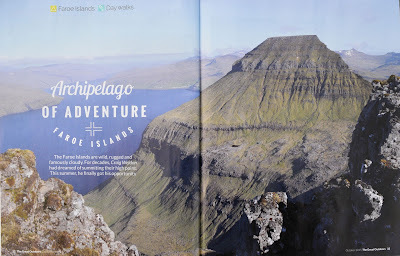 Well as you have seen in Impressions of the Faroe Islands, Faroe Adventure: the Torshavn Marathon and The Fantastical Faroes - I finally achieved that long-held ambition to visit. And I left the best till last, the ascent of Slaettarartindur, at 882m the highest hill in Faroe. This mountainous group of islands is an absolute paradise for hillwalkers. So good in fact, I wrote about it in the October 2015 issue of TGO magazine. So why not 'archipela'-go and get yourself a copy? I was in Hawick for a 10k race, but had a bit of time to spare. I'd passed through before but never really looked round - the general impression from the A7 is of boarded up mills and the air of a town past its prime. But passing through on the A7 doesn't do Hawick justice. 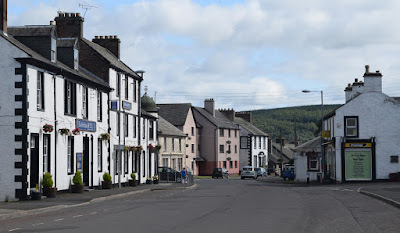 This is a handsome town with steep streets in a green Roxburghshire valley. Was it my imagination, or did the locals look sportier and healthier than your average? Maybe it was just people gathering for the 10k and the local sports grounds emptying of players. This is a big rugby town, and horse riding is popular in the Borders. I had a wander up the main street. The usual charity shops and Greggs with just a few independent local businesses. No different to any other Scottish town. 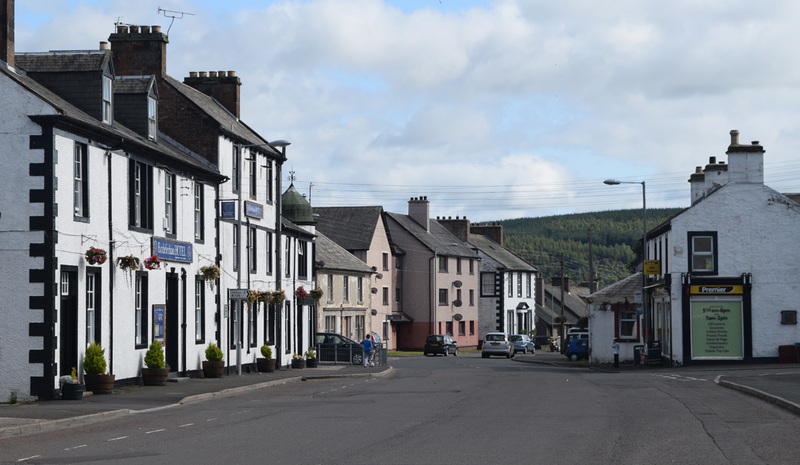 What would it take to improve the vitality and economy of Scotland's many small towns? Proper local democracy? A system of Mairies as in France? A more equal distribution of the national GDP? Better infrastructure links? 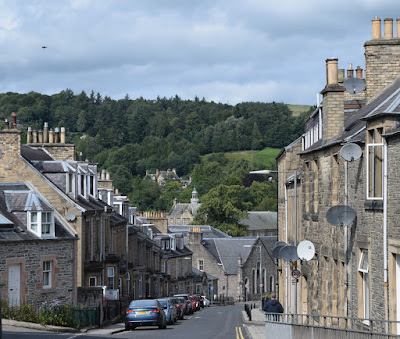 Hawick, after all, is known as the furthest decent sized town from a railway station anywhere in Britain. I wonder if the partially reconstituted Waverley line between Edinburgh and Galashiels changes that? This statue is the town symbol. You see representations of it everywhere. It commemorates an event that happened after the battle of Flodden, where Hawick's adult male population was killed. 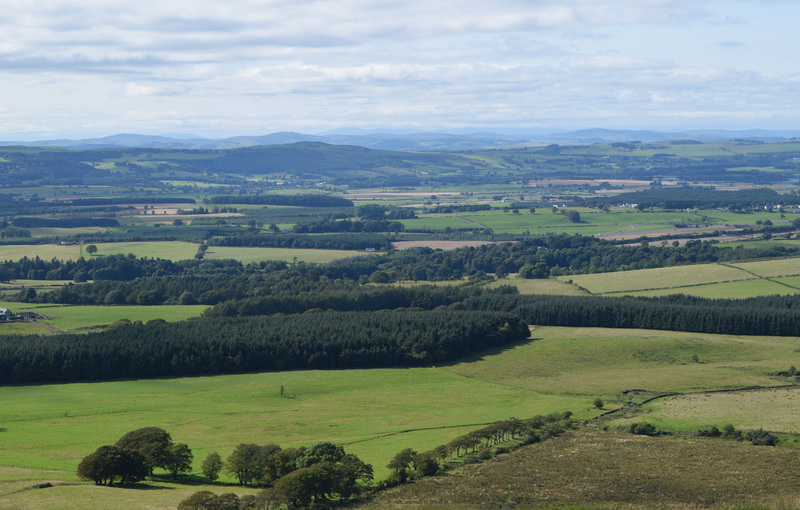 Flodden left Hawick open to attack from roving bands of English reivers, who were not slow to take advantage. 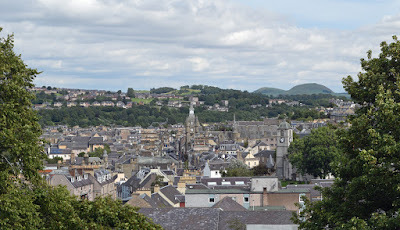 Hawick would undoubtedly have been sacked like other Border towns were it not for a daring night raid by the boys of Hawick on a camp of bandits led by the Bishop of Hexham. 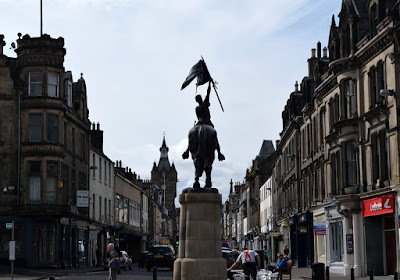 The surprise night attack turned the tables on the English reivers and Hawick was saved. The statue shows a youth returning with the Bishop's banner - an event commemorated every year in the annual Common Riding. 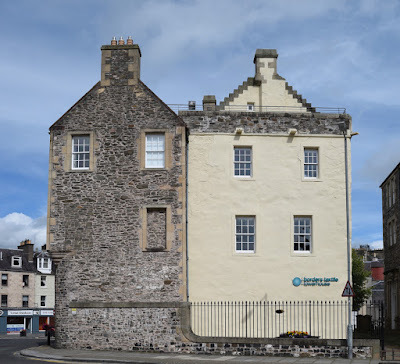 Hawick' history is older than this. Up a side street sits a small artificial hill known as the mote. This is a 12th century construction built by the Norman Lovel family and would at one time have had a wooden fort on top. 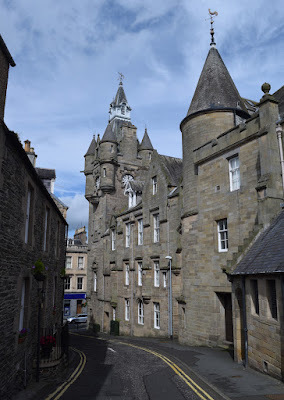 I had never heard of Hawick's mote until my little wander around. It features in the Common Riding celebrations too, as the cornet mounts the hill at dawn to sing the town song and kick off the festivities - which The Rough Guide World Party describes as "an equestrian extravaganza that combines the thrills of Pamplona's Fiesta de San Fermin with the concentrated drinking of Munich's Oktoberfest". The mind boggles! As I left Hawick, I heard a woman say to her wee son "would you like to see the motorbikes?" They joined a crowd lining the A7 where they could watch the memorial run to Steve Hislop. Steve was a superbike champion who grew up near Hawick and died here too, in a helicopter crash in 2003. As I left the town hundreds of motorbikes came in the other direction in an annual riding of a motorised kind. In the town furthest from the railways, they like their transport with saddles on. "One day," you say to yourself driving down the M74 and seeing the signs at Junction 19 for Ecclefechan, "I'm going to turn off the motorway and visit Ecclefechan." But of course you never do. Then one day, I did. Oh there's not much to do // in Buccleuch. The same could be said for Ecclefechan. But this is a place with an ancient history. I'm not talking about the neat street of the 18th century village, or the birthplace of Victorian man of letters Thomas Carlyle, now in the care of the National Trust. I'm talking something much older and more dramatic, but nowadays completely hidden from view. 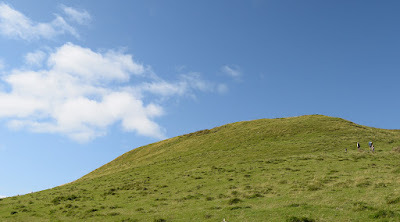 What I am talking about is flat-topped Burnswark Hill, once ceremonial gathering point of the the Anavionenses tribe. 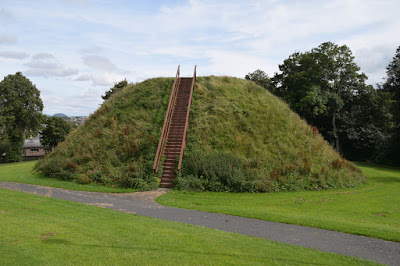 The Anavionenses were the Iron Age inhabitants of Annandale. 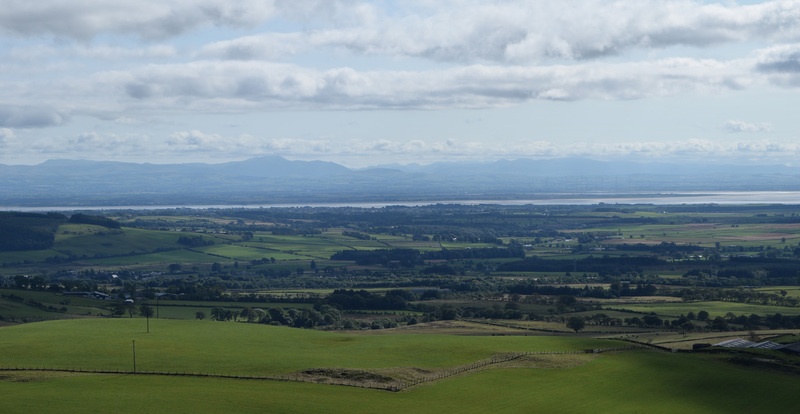 They saw the Romans sweep north to Mons Graupius, south to Carlisle, north to the Antonine Wall, then south again to remain behind Hadrian's Wall. Sitting just a few miles north of Hadrian's Wall, Annandale was frontier country for the Romans, and they built a tax outpost called Blatobulgium (bulging bag) at the foot of Burnswark to collect tribute from the Anavionenses. In AD 155 the Anavionenses sacked Blatobulgium, and the Romans retaliated by laying seige to Burnswark. 200 years earlier they had defeated a massive Gaulish army at a similar hillfort of Alesia, and it is tempting to imagine a mass of Anavionensian infantry and cavalry cooped up in Burnswark with the Roman artillery raining down on them. However after Mons Graupius the Caledonians tended to avoid engaging Roman armies directly, preferring the guerilla tactics that they excelled in. It would be surprising if there were many people at home when the Romans vented their fury in target practice against the local tribe's sacred site. This hill is extremely modest. It is not one you would notice unless you were looking out for it. At the roadend I was surprised to find a small crowd, but the reason soon became clear. An archaeological dig had just finished and there was a display of locally found artefacts. 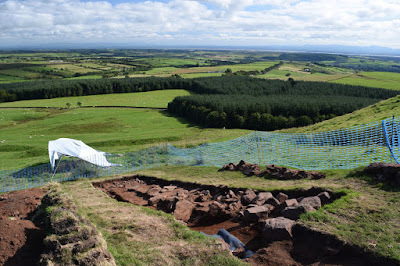 "The dig has been good," said the archaeologist, "locals have tended to neglect the hill, but now there's a bit of pride and interest. Lots of them have signed up to volunteer for next year's dig. Would you like to sign up too?" The dig site had yielded artefacts both ancient and modern - including WWII mortar shells, which had to be disposed of by the bomb squad. 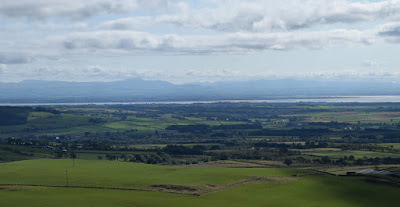 After peching up the steep ramparts the view from this small hill was a revelation - the whole of the rich grassy farmland of Annandale, across the Solway to Cumbria, the Galloway Hills, the Tweeddale Hills. 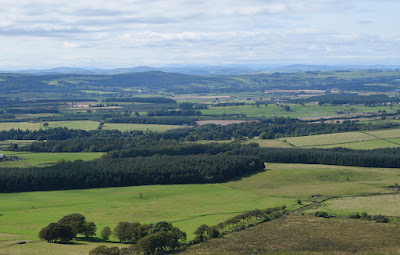 (Almost, even, the Hills of Buccleuch.) No wonder the original inhabitants chose it as their ceremonial gathering place. 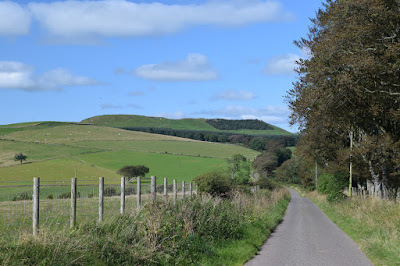 Next time you are looking for a leg-stretch on your drive north or south, why not pull over at Junction 19 and have a wee jaunt up Burnswark Hill?